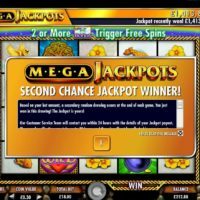 If you thought the last MegaJackpots win of £747,425 in June 2018 was Mega, then this one is colossal! The latest lucky winner, Jordan from London, has hit the IGT MegaJackpots and won a staggering £1,413,800.62. Aside from online slot machines, Kerching Casino also hosts the MegaJackpots games series, developed by IGT. Each has a progressive jackpot of hundreds of thousands of pounds, making them increasingly popular. The game Jordan won with was the MegaJackpots Isle O’Plenty, a popular choice among players. Irish-themed games are particularly popular among slot players worldwide, and in Jordan’s case, it certainly was the ‘luck of the Irish’. Jordan’s win is the first of this magnitude for Kerching, and IGT has confirmed that this has been the largest win ever since the MegaJackpots games were re-vamped in February 2015. The progressive jackpot starts at £500,000 and is reset to this amount every time a jackpot prize is won across any of the games in the series. Last year, the MegaJackpots had six winners, with an average payout of £775,000. Jordan is the 43rd winner from this series in four years. In addition to this huge win, Kerching has announced a new Wheel of Fortune MegaJackpots slot launching on April 25, 2019.